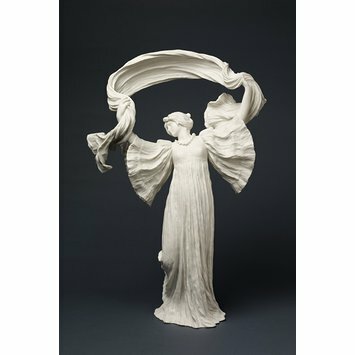 This figure conveys, in ceramic form, the movement and energy of dance and typifies the spirit of Art Nouveau style. 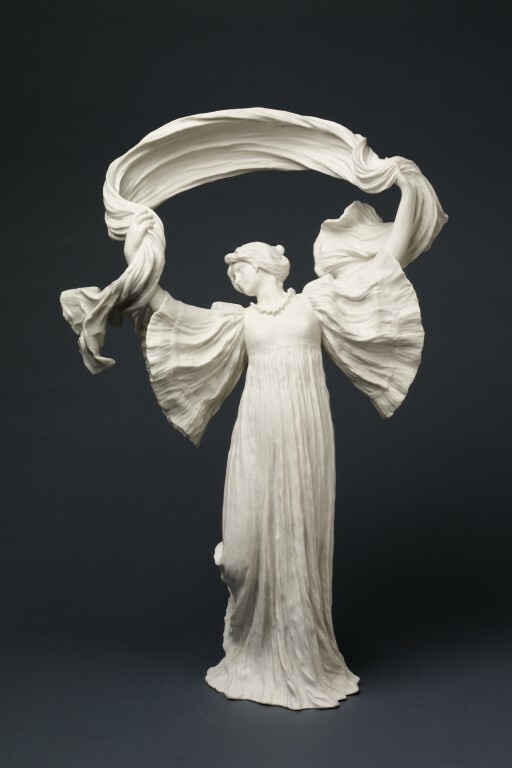 It originally formed part of a group of 15, entitled 'Jeu de l'Echarpe' ('Scarf Dance'), and was inspired by the sensational dance performed by the American Loïe Fuller, a regular fixture at the Folies Bergère, Paris. The form of the free-flowing, silk-clad dancer was employed as early as 1893 in an iconic lithograph by the French artist Henri Toulouse-Lautrec, and the elegant theatricality of this Sèvres figure group further established the motif in turn-of-the-century Parisian art. The group was designed by Agathon Léonard in 1898 and displayed at the Universal Exhibition in Paris in 1900, where Sèvres won a prize. The success of the figures, described in the exhibition report as 'a graceful and charming ensemble which were a great and deserved success', followed the adoption of a consciously progressive art policy at the factory, part of a national move towards the regeneration and celebration of French craft skills and design. The figures were produced by Sèvres in many editions and were also copied in bronze and porcelain by other factories. Biscuit porcelain, of which this figure is made, was a material developed and pioneered by Sèvres in the mid-eighteenth century. It continued in popularity throughout the nineteenth century, as it was well suited to the popular classical forms of that period. Although porous and easily stained, biscuit porcelain was much used for table decoration during the eighteenth and early nineteenth centuries, particularly at dessert. Biscuit porcelain female figure, head turned to one side, and one leg bent backwards, wearing wide-sleeved floor-length dress and holding a scarf aloft with both hands. 'S' and '1904' in triangle, 'No 12 under base, '4' and back-to-front 'R' at base. Liefkes, Reino and Hilary Young, eds. Masterpieces of World Ceramics.. London: V & A Publishing, 2008. p. 124-125, ill. ISBN 9781 851 775279.